Adolf Guyer-Zeller was a man with a singular vision. The Zürich entrepreneur had inherited a spinning mill from his father and founded his own textile export business, but in later years he would set his sights on the lucrative pursuit of building railroads. Switzerland at the end of the 19th century was in the grip of “mountain railway fever”, and Guyer-Zeller was determined to create the most impressive and daring of them all. Inspiration struck one summer’s day in 1893, while on a hike with his daughter in the Bernese Highlands. It was the sight of a train on the newly opened Wengernalp Railway that fueled Guyer-Zeller’s imagination. 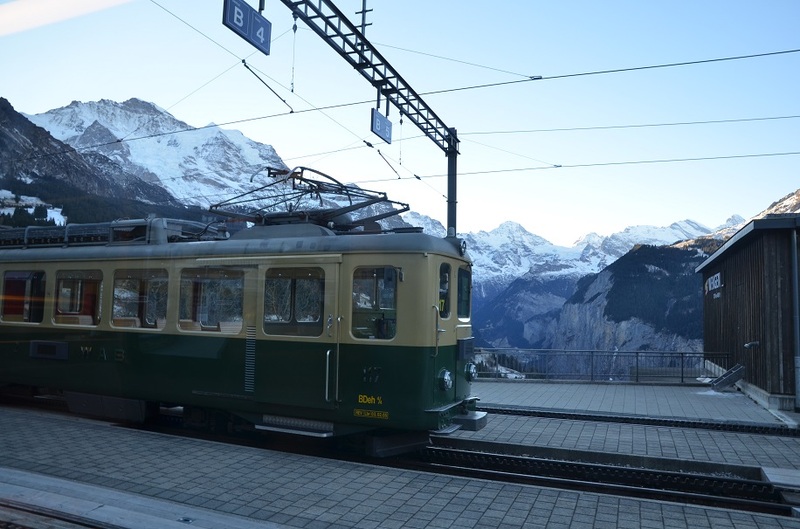 The savvy entrepreneur had seen passenger carriages traveling up to Kleine Scheidegg, a picturesque mountain pass in the shadow of Eiger, Mönch, and Jungfrau, a noble trio of snowcapped peaks roughly 4,000 meters high. Guyer-Zeller returned to his hotel room to sketch his proposal for an electrified cogwheel railway that would lead from Kleine Scheidegg through Eiger and Mönch, terminating in a station inside Jungfrau itself, where an elevator whisked tourists to an observation deck on the 4,158-meter (13,642-foot) summit. Local authorities granted Guyer-Zeller a construction license at the close of 1894, and ground was broken in July 1896. The 9.3-kilometer railway required a great deal of manual labor. 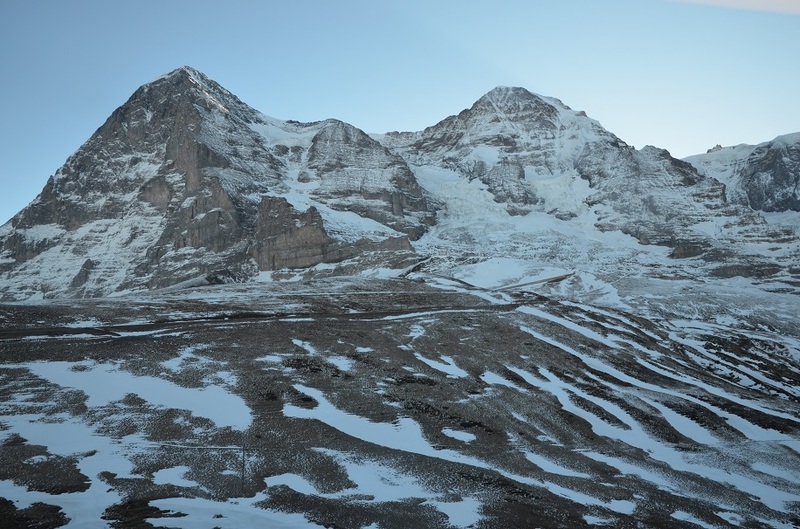 Only shovels and picks were used for the open-air section from Kleine Scheidegg to the Eiger Glacier, and laborers faced an even greater challenge in dynamiting a curved tunnel of more than seven kilometers through the solid rock of the Eiger and Mönch mountains. 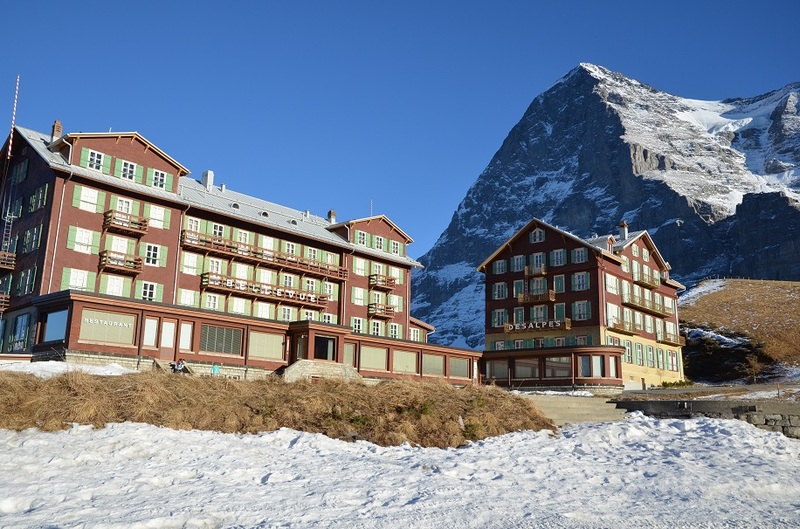 Roughly 90 percent of the workforce was Italian; they toiled all year round, living out of a purpose-built colony at the base of Eiger Glacier that had running water, electricity, and heating; not to mention a large structure housing a restaurant, a grocery shop stocked with winter supplies, and even a sick room. A testament to Guyer-Zeller’s marketing genius, the Jungfrau Railway became a popular tourist attraction even before it was finished. The project’s opening in stages meant that visitors could marvel at the views from intermediate stations even as workers continued to excavate at the higher sections. 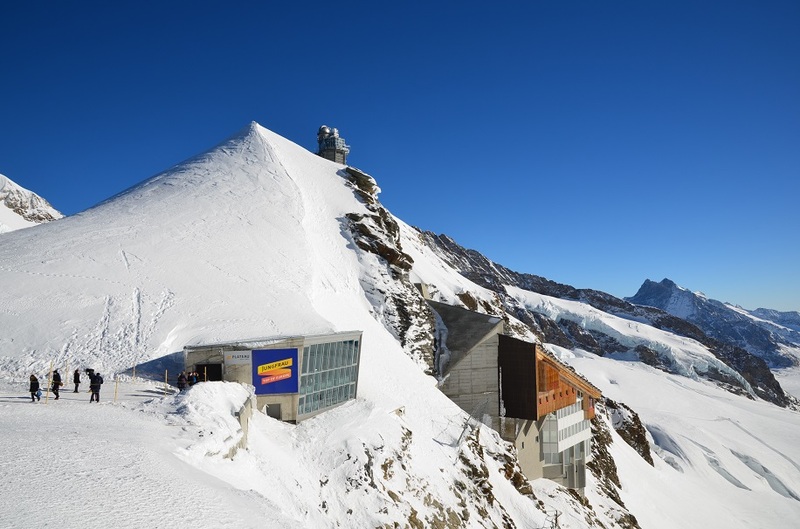 Even today, a journey aboard the Jungfrau Railway includes a five-minute stop at Eismeer (literally “Sea of Ice”), a station named for the blocks of bluish ice that can be seen through windows carved out from the mountainside. Tragically, Guyer-Zeller did not live long enough to see the completion of his visionary mountain railway; he died of a heart attack just three years after construction began. But the work continued in spite of financial difficulties, six workers’ strikes, and other challenges. Then there was the human cost of building the Jungfrau Railway: 30 men were killed and another 90 injured, mostly in blasting accidents. 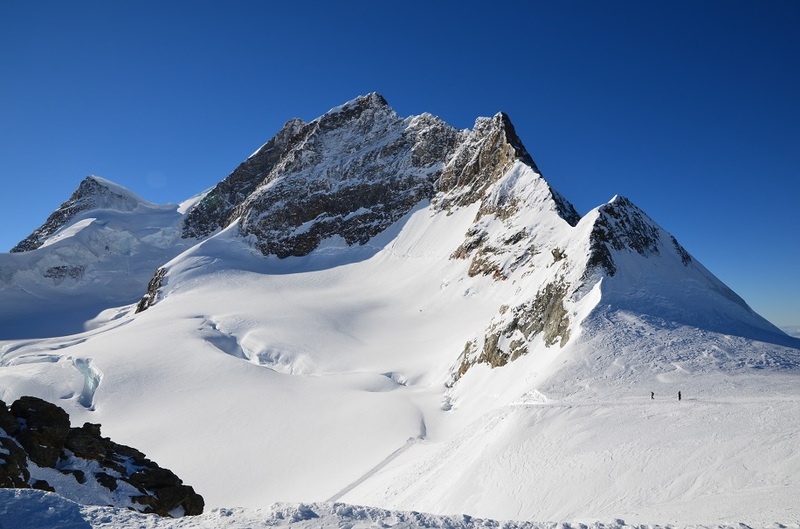 Finally, on August 1, 1912, some 16 years after the project broke ground, the first trainload of visitors arrived at Jungfraujoch station below the snow-covered saddle between Mönch and Jungfrau. 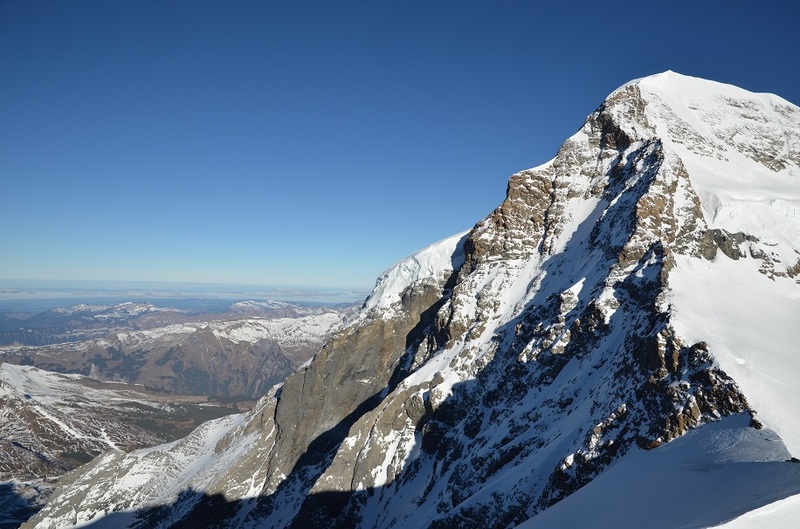 The original plan to reach the summit of Jungfrau via an elevator was never realized, though the final outcome remains a record-breaking feat. 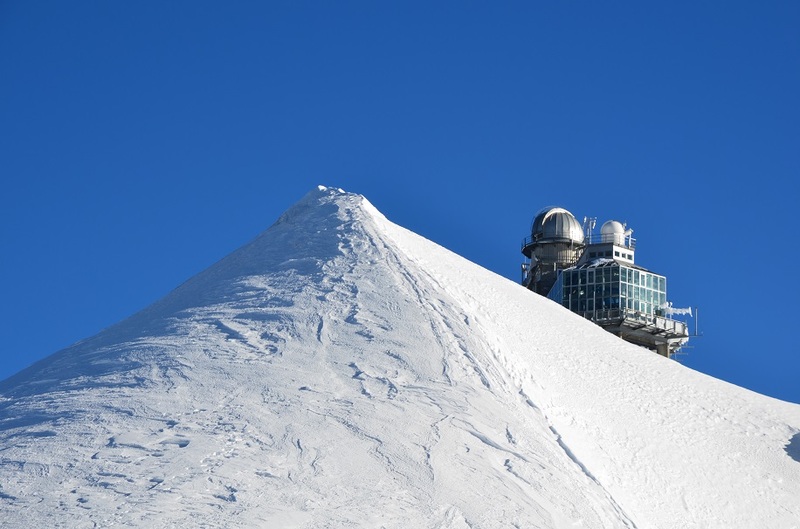 More than a century after its completion, the terminus at Jungfraujoch still holds the distinction of being the highest railway station in Europe, a whopping 3,454 meters (11,332 feet) above sea level. 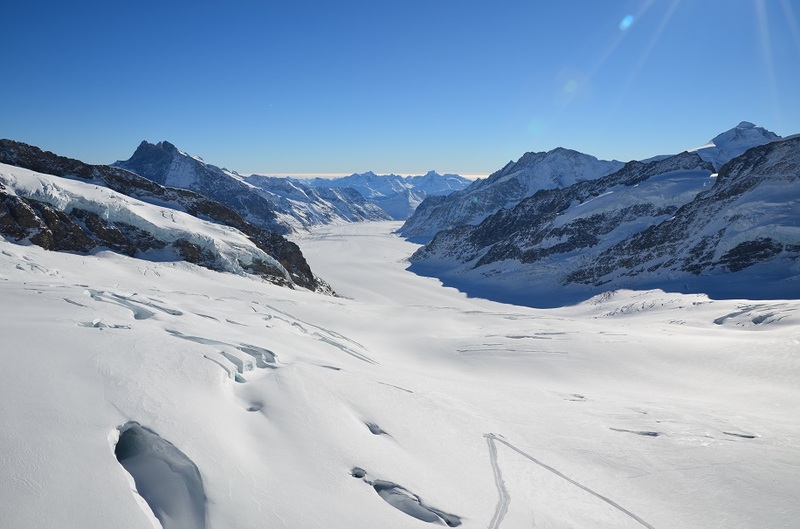 Jungfraujoch makes for a worthwhile day trip from the nearby town of Interlaken, and not just because of its year-round snow cover. I am fortunate to have Sandra Kaiser from Jungfrau Railways as my guide throughout the journey – she explains the local history and how the mountains received their names (Jungfrau means “Virgin” and Mönch is “Monk”; the former refers to the pure white snow on its slopes, and the latter recalls the monks at Interlaken monastery who kept their horses at the mountain’s base). 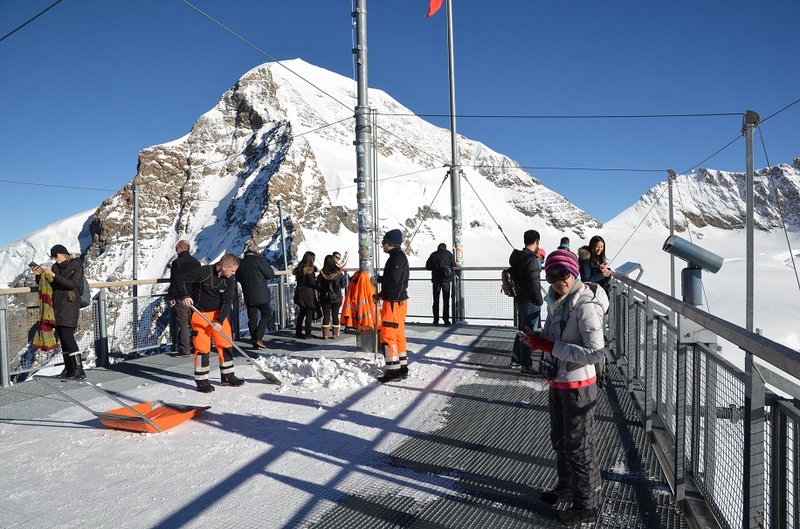 As Sandra demonstrates, getting to Jungfraujoch is far easier than it sounds. We hop aboard a train from Interlaken Ost station to the steep-sided Lauterbrunnen valley, whose dream-like scenery and 72 waterfalls inspired Rivendell in Lord of the Rings, and change at Lauterbrunnen for the Wengernalp Railway to Kleine Scheidegg. We’re joined by a contingent of Swiss students and a motley of visitors from farther afield. Just 48 minutes after boarding the train at Kleine Scheidegg, Sandra and I disembark into a cavern at Jungfraujoch. 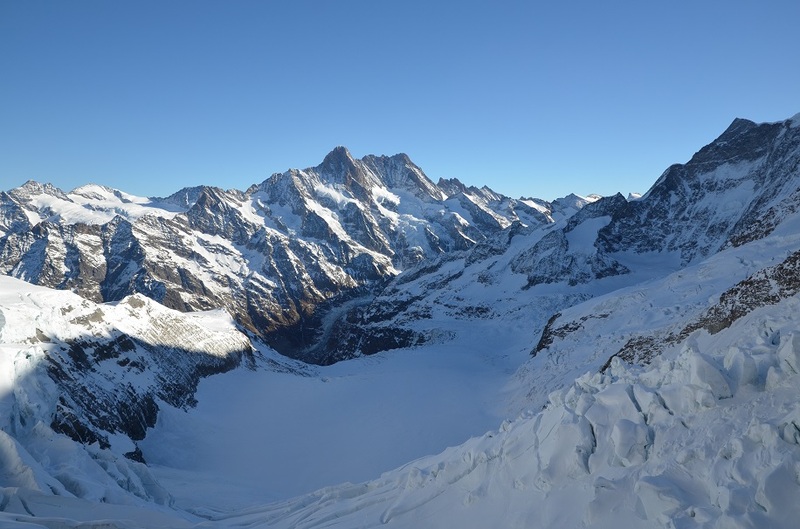 Going out of bounds – never mind the crevasses! 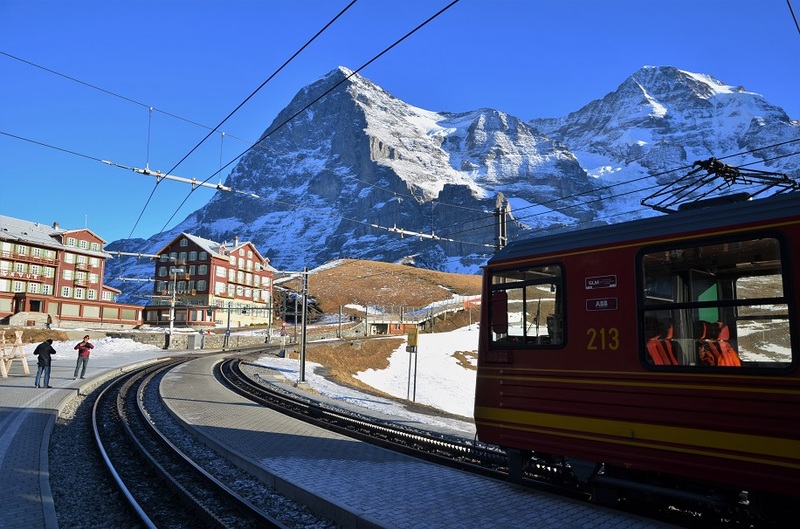 A miracle of extreme engineering, the Jungfrau Railway has opened up an otherwise inaccessible snow- and ice-bound world to the ordinary tourist. Its presence means that the Bernese Alps are no longer the preserve of hardy mountaineers, rock climbers, and serious trekkers. 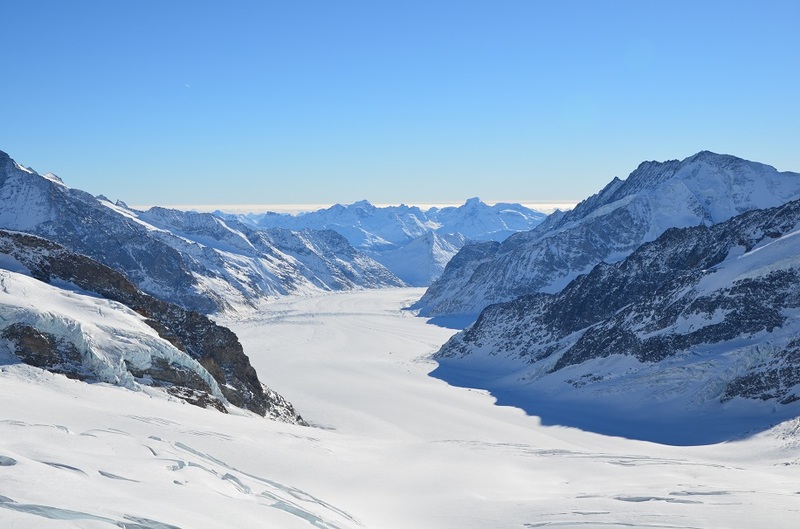 From Jungfraujoch, the adventure-minded can opt for a two-day guided trek on the 23-kilometer-long Aletsch Glacier, the largest and longest in the Alps. It’s a memorable way to soak up the surrounding high-altitude landscape, which was listed as a UNESCO World Heritage Site in 2001. Not far from the rail terminus, a high-speed elevator takes visitors to the outdoor observation deck at the foot of the Sphinx Observatory, an atmospheric research station perched on its namesake rock formation. 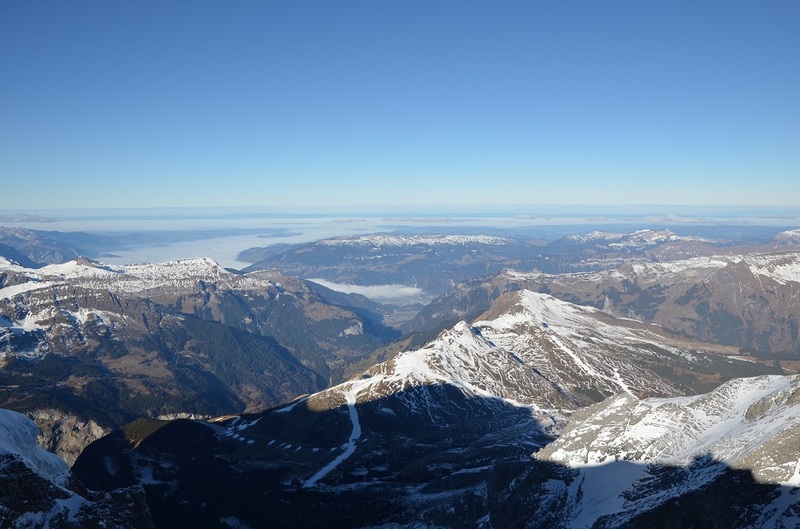 The views from Jungfraujoch are sublime, and thanks to the more than 3,000-meter elevation difference with nearby Interlaken, breathtaking in more ways than one. Less so is the place’s mass-market appeal: shops here sell wooden handicrafts and other knickknacks, Victorinox Swiss army knives, and even spray cans of pure mountain air. Shoppers at the in-house Lindt Swiss Chocolate Heaven can try their hand at using a vintage-style chocolate mixer, then stock up on Lindt classics at cheaper prices compared to stores in the valleys below. I think you would love it there – especially with all the opportunities to go mountain biking nearby! You know how I always dream of touching snow — although technically I’ve experienced my first snowflakes in Istanbul four years ago. Reading this post and scrolling through your crisp photos remind me that I really should plan a trip to go somewhere with lots of snow. As for the railway, it’s amazing how this was constructed more than a century ago! If this were done today I wonder how long it would have taken to finish — modern technology could make it fast, but financing could be a major hindrance, not to mention public scrutiny. On a lighter note, that’s a lot of cheese you had! I’m impressed. 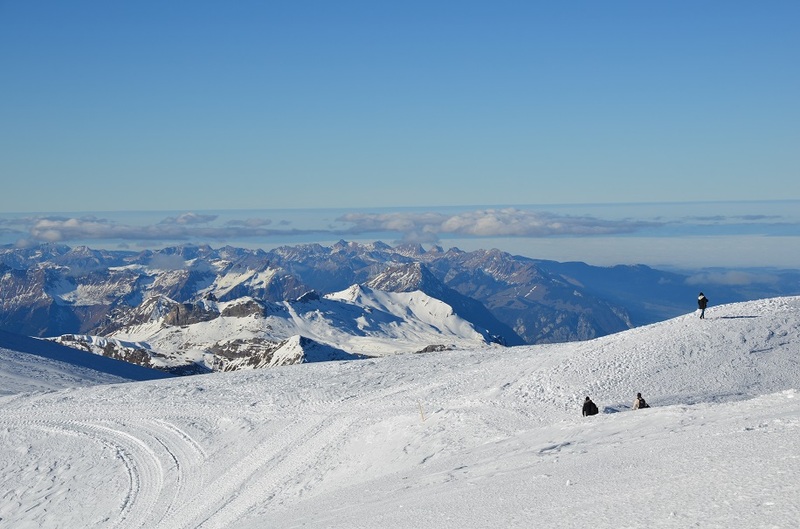 Ah yes, there was a lot of snow up there, but central Switzerland was going through a warm spell at the time so it wasn’t fresh powder! Someday we’ll just have to plan a joint trip to a snowy place in the winter months. Swiss engineering is something else; no other country could dream up and execute something as crazy as the Jungfrau Railway. As for the fondue, I must have gained a couple of kilos from all the (delicious) cheese I ate in those 10 days. Fabulous photos and a great post. Been to Switzerland many times but never managed to make it up the Jungfrau due to bad weather every time. Maybe this year is the time to go. Thanks Jon! Guess I was very lucky with such perfect conditions the first time around. Fingers crossed the weather will cooperate when you go back. Truly a marvellous man-made wonder! Before reading your post, I thought the only way to go there is driving – a very long and unpleasant car-trip. But it seems not so difficult by trains 🙂 Very beautiful photos as always, James! Thank you, Len! Actually I’m not sure how far you can go up the mountain by car… you might have to park in Lauterbrunnen and hop on the train from there. I think the bad behavior is common to many big countries – on my trip I heard a lot of complaints from people who worked in Swiss hospitality and tourism about the attitude and actions of both Chinese and Indian tourists. What a visionary Guyer-Zeller was! It must have been amazing to ride that railway to the top, and the meal afterwards sounds pretty good too. Nice post James. Absolutely, Alison. 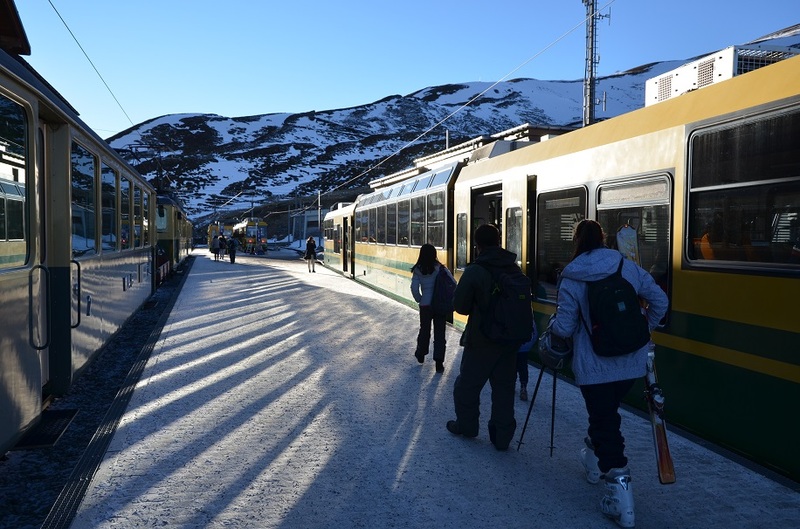 Only a Swiss entrepreneur would have thought of this extreme mountain railway – most of the journey (being in a tunnel) was pitch-black so that made the panoramic Alpine vistas from the top even more special. Man…you gotta love an animal who can do all the tricks it can. I just read Bama’s latest post and marveled at what man did centuries ago. Now this. No wonder man is at the top of the food chain. And speaking of food chain…man invented fondue you know. Ah yes, but sometimes the actions of some powerful human beings (on the question of nuclear buttons and the like) makes me question whether we even deserve to be at the top of the food chain. Humankind is only capable of great things when we direct our energy to progress, innovation, and improving the lot of those less fortunate than ourselves. JAMES…”progress, innovation, and improving the lot”…you know those are very true words. But also, most of all that progress and innovation stuff throughout history has come from our apparent need for war. That must say something about the animal at the top, eh. It’s my pleasure, Caroline. This was my first trip back to Switzerland after 16 years, and it made me wonder why I hadn’t returned any earlier. Happy New Year to you too! 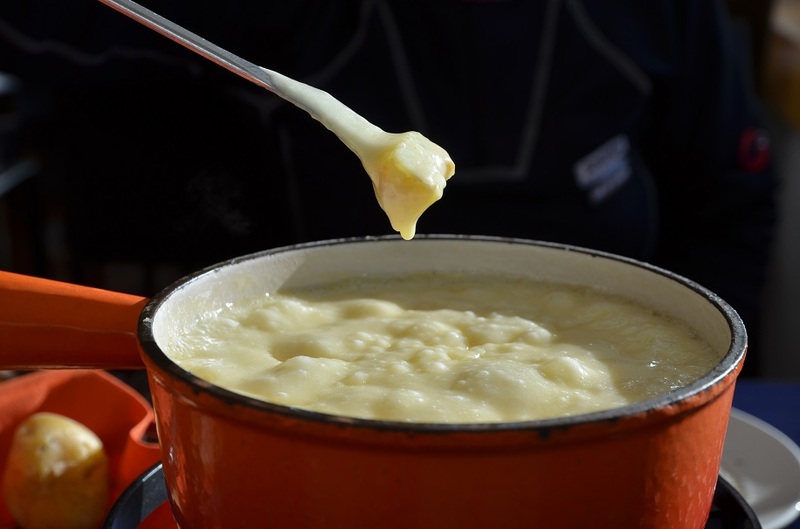 You grabbed me with the incredible Alpine peaks, but had me for good with the fondue! My husband waxes euphoric over Interlaken and its environs all the time, and this railway might be the kick I needed to check out the area myself. I’ve wandered the Alps in other parts of Switzerland and elsewhere, but have never actually made it to this particular place. Beautiful photos, James, and quite the construction story! Happy 2018 to you! Thank you, Lex – wishing you a happy and healthy 2018 with many wonderful trips in store! 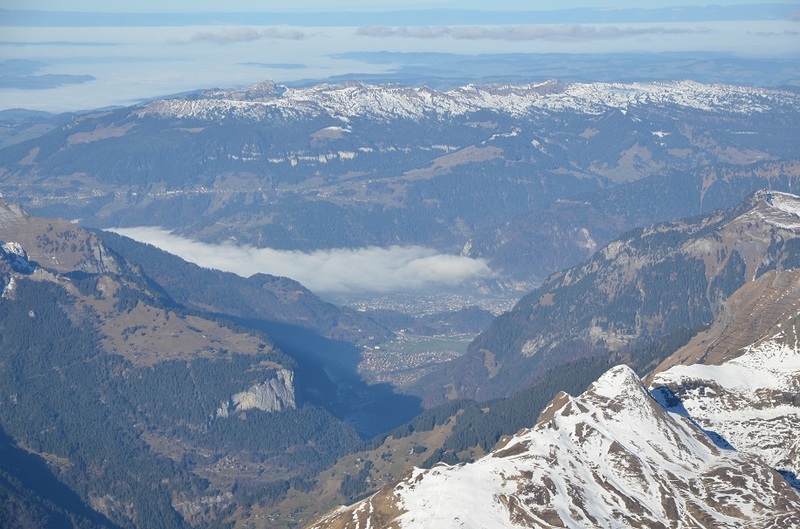 I also did a hike in the mountains to the north of Interlaken, which was gorgeously empty and a nice change from the tourist crowds at Jungfraujoch. Not sure if I will post the photos though as there wasn’t much of a story there! What a great experience you had! 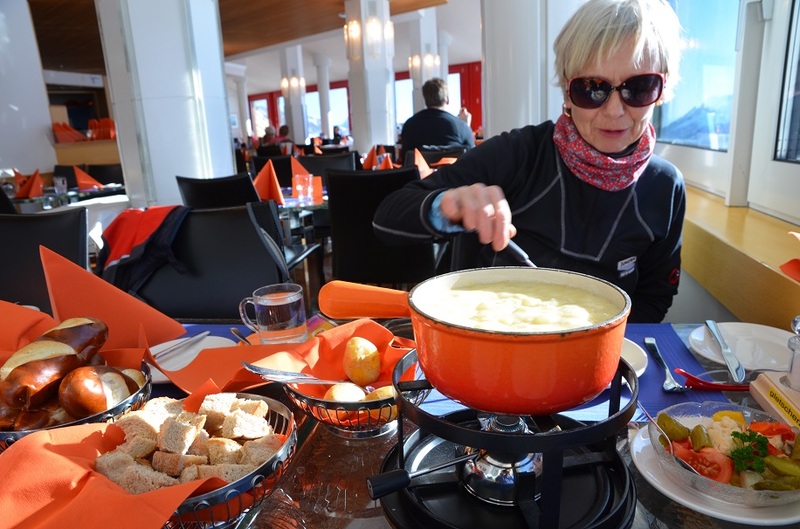 Spectacular scenery, interesting history, and oh, that fondue! I am sending this blog to our Swiss friends here in Oaxaca. Thanks for a wonderful blog and best wishes for 2018. I have no doubt that you would have enjoyed it, Marilyn. 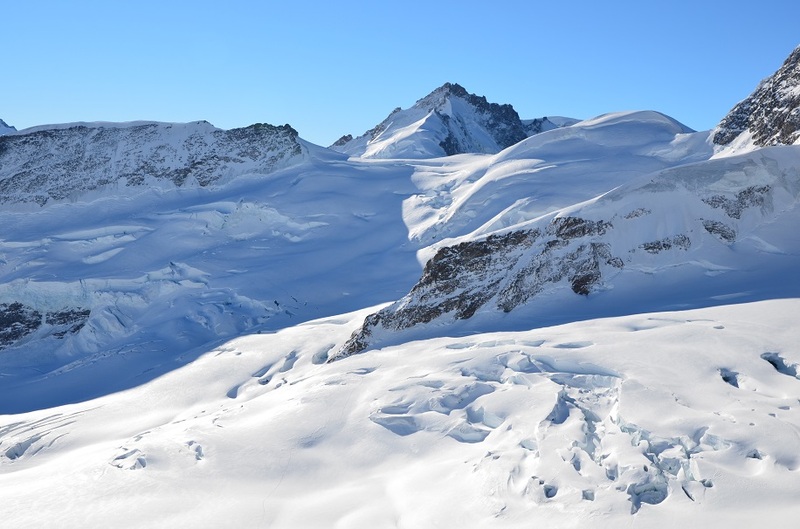 When I told my Swiss family friends about the place a few days later, they told me they’d never been to Jungfraujoch (because it is more geared towards tourists). WIshing you a great start to 2018 and a year filled with memorable adventures! That looks spectacular and very cold. I agree with Bama’s comments about what if this were built today. I could see there being a lot of obstacles to that! Anyway, great post. Thanks Jeff! 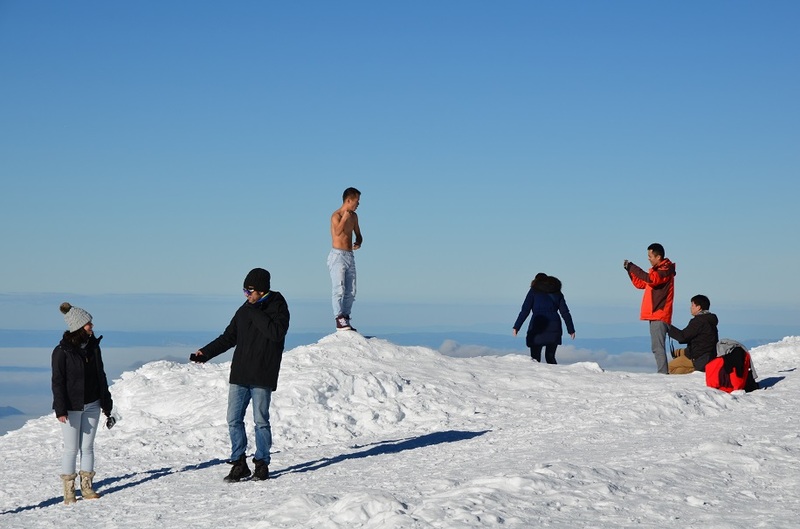 It wasn’t nearly as cold as I expected – though I imagine it would be freezing at night. Much appreciated, Rahul. Your son is very lucky to have such open-minded parents who love to travel! 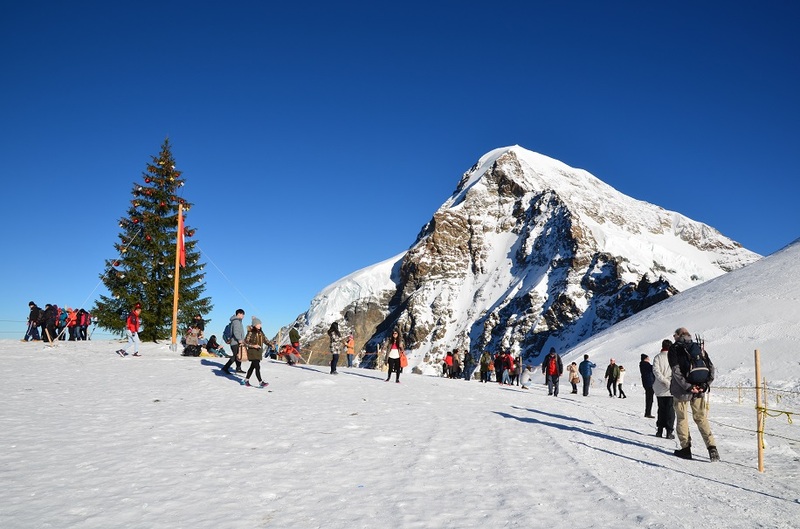 Many of the locals I met working in the tourism and hospitality industries told me that Switzerland has become a popular holiday destination for Indians in recent years… from an Asian perspective, I can really see why that is.